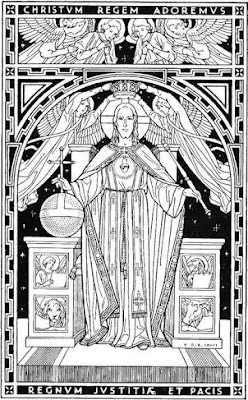 Why did Pope Pius XI, when he established the Feast of the Kingship of Our Lord Jesus Christ with his encyclical Quas Primas un 1925, not choose for it the last Sunday of the liturgical year (as Paul VI did later for his new mass), but rather the Last Sunday in October? The short answer is simple: Christ the King is the Anti-Luther. The Lord is not the king of this or that German princedom, changing doctrines according to the whim of the moment. He's the King of the Universe, unchanging and unchangeable. As a counter-feast of the "Reformation Sunday" Protestants celebrate on the last Sunday in October, Pius XI proposed Our Lord, King. - For a longer and more detailed explanation, please read this 2014 post by our contributor Dr. Peter Kwasniewski.